As you know, dear Readers, I take long walks with my dog, Zeke, almost every day. It has given me the time to contemplate, enjoy, see, smell, hear and just be with my surroundings. Sometimes we have to cross busy, noisy streets; but always with the intention of finding some new quiet pathway or park; or better yet, rediscovering something that I’ve known was there but just never really took the time to see and experience. This is what happened on our last walk. I had decided to cross over to the riverside (which means walking for a short time on a less enjoyable path). I had two options within a reasonable walking distance. Walking along Fort St-Louis, which is one of the main boulevards in my neck of the woods and taking the “secret” passage, or crossing over Marie-Victorin, another main boulevard, which is a little busier and has no sidewalks for part of the way. I chose the first to go and the second on my return trip. This path went along “my” river (which I now know is called Sabrevois) and brought us over to the Louis-Hippolyte Lafontaine House in de la Broquerie Park in Old Boucherville. This house has been standing since 1766, was the birthplace of Louis-H. Lafontaine in 1807, and moved to its present location and classified as a historical monument in 1965. It is funny how you can have a piece of history in your back yard and yet no nothing about it, having never taken the time to find out. This caused me to Google him and the City of Boucherville and learn more. There is still more reading to be done but for now, I post! About 100 yards away lie the remains of the “Chateau” Sabrevois, built in 1735, then given to the Jesuits in 1887 and then renamed La Villa La Broquerie. It was expanded over the years and between 1910 and 1952, became a retirement home considered the birthplace of closed pension plans in Canada. Sadly, a fire destroyed the Villa in 1970 and this is all that remains, alongside a plaque explaining the particulars. After our little historical stop, Zeke and I made our way towards the St. Lawrence River. We spotted some wildlife, including this lovely guy, posing solo, and this pair of ducks! Walking towards the marina and rowing club, we spotted this private dock. What a fabulous place it must be to sit and watch the comings and goings on the river, with a view of the Boucherville Islands! We continued on and arrived at the special ferry dock. During the summer months, cyclists and pedestrians can be ferried across to the Islands, a Provincial Park, for the “modest” sum of $6.50; $2 off if you have a Provincial park pass…. I then attempted to take a picture between the rails, figuring it would frame nicely and ended up cropping the rails out! Makes the picture look quite panoramic, don’t you think? At this point, we decided to turn back home, this time walking along the bicycle path. I made the mistake of going down to the docks at the rowing club. Next thing I know, I hear “Splash!” as Monsieur Zeke decides this is a great place to jump off from! After sighing at Zeke, I decided to walk along the long dock and Zeke joined me. 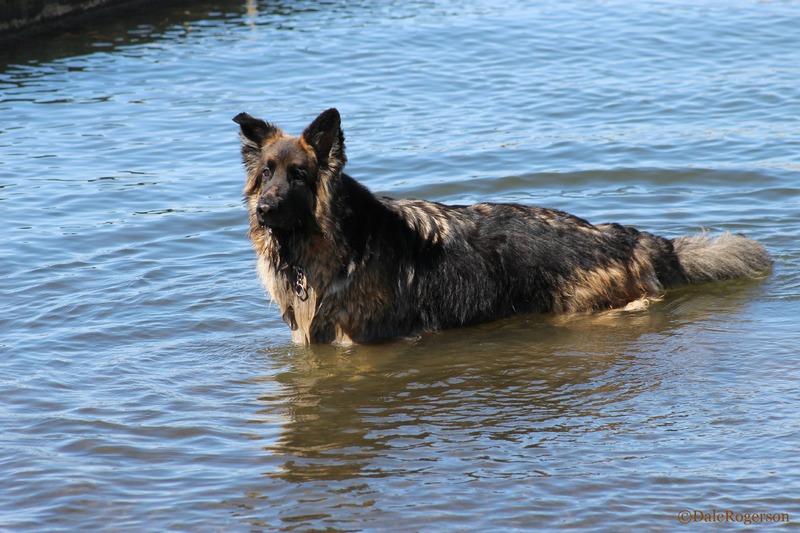 There were many sticks floating around the dock which caught Zeke’s eye…. So next thing I know, in falls Zeke, head-first! He attempted to get back up on the dock and no matter how much I tried to convince him to swim to the shore, he kept turning back to me. So I grabbed him by the collard and hauled him up. 85 lbs of wet dog is NOT an easy task! Just look at him sitting there like nothing happened!!! 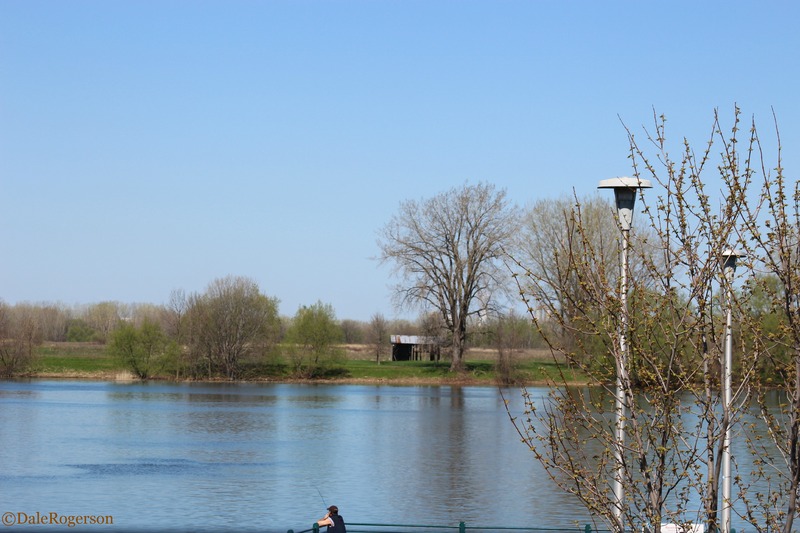 This entry was posted in Boucherville, fun stuff, History, Well-being and tagged de le Broquerie, Iles de Boucherville, Louis-Hippolyte Lafontaine, mallards, old Boucherville, St. Lawrence River, Walks. Bookmark the permalink. Sounds like a lovely walk again! And it is nice to see that the snow has melted providing opportunities for vegetation and animals. Oh yes! It is positively HOT today and yesterday! Woo hoo! You will be more outside as I will stay more inside :). I imagine so… it will get way too hot in your neck of the woods! If you don’t hear from me for a while I will have floated too far downriver…. Good to know! Don’t float too far! Dale, thanks for the wonderful look around your town–you may have a future as a tourguide! And I ADORE that last shot of Zeke! Oh my goodness, that is priceless! Dogs are lucky they’re so sweet and cute, aren’t they? The fixes they get themselves into…tugging us along for the ride! You are most welcome! It was fun to actually take the time to see what is right there! And, as for Zeke… what can I say? 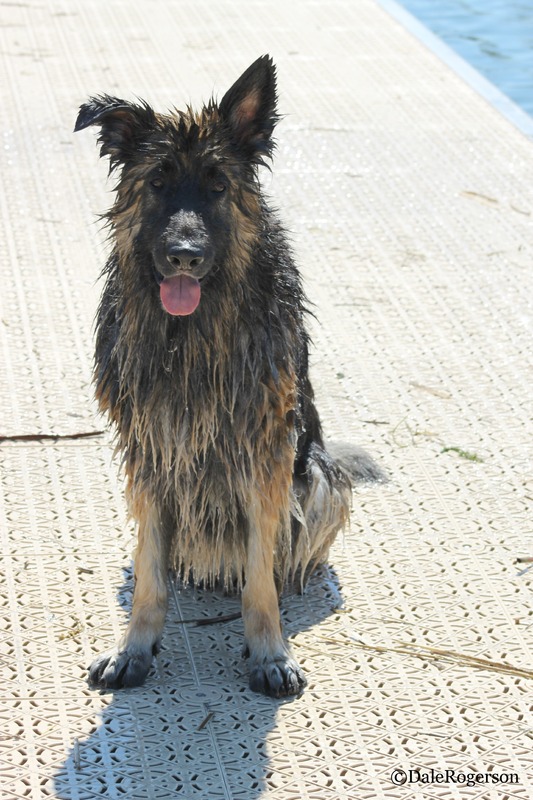 In another life, he must have been a water dog! He does keep me entertained, that is for sure! Fun post Dale and some great shots!! Zeke has the heart of a puppy and I am super impressed that you were able to lift him up out of the water! That must have been fun! He does and so am I! I almost dropped my camera while pulling him up… friggen dog! Lovely post, Dale, and great to be included in your walk with Zeke. I know those splashes all too well!